I decided to photograph rice today after reading an article online regarding the virtues of brown rice over white rice. The article was on a study performed by researchers from Harvard University who determined that brown rice reduces the risk of type 2 diabetes whereas consumption of white rice increased the risk of developing type 2 diabetes. Apparently brown rice and other whole grains release glucose more gradually while white rice can cause a blood sugar spike. Researchers speculated that by switching to brown rice a person could reduce their risk of type 2 diabetes by one-third. What is brown rice and how does it differ from white rice? Brown rice is rice that has not been milled or has been only partly milled. White rice on the other hand is rice that has been processed or milled to remove the husk, bran and germ. This difference allows white rice to be stored for much longer periods of time whereas brown rice becomes rancid much more quickly. 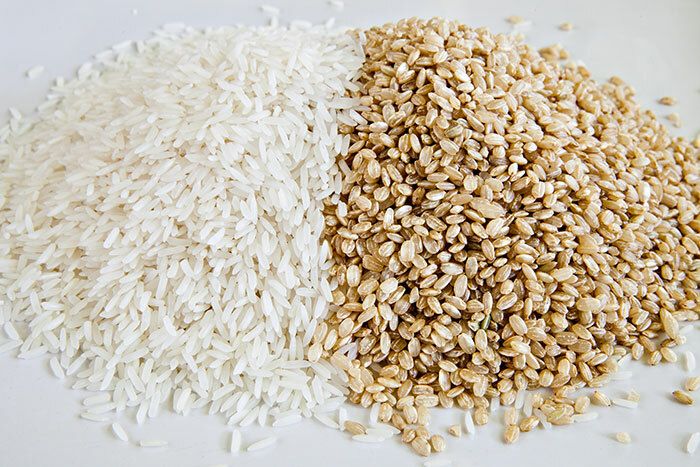 The milling process of white rice removes important nutrients which makes brown rice a much more nutritious selection. It’s thought that the oil in the bran (removed in white rice) can actually lower LDL (bad cholesterol) levels. Brown rice also has more fiber which is good for the digestive system. I would suspect that many people don’t eat as much brown rice because they may dislike the more nutty flavor and chewier texture. This photo of brown and white was taken with 100% natural light. First I positioned a white plate near a window but I found the light wasn’t quite strong enough. So In used a silver reflector to bounce more light back onto the subject. Shutter speeds were still quite slow with the aperture I was using (f/20 @ 3.2 seconds) so I used a tripod to keep the camera steady. Also, to minimize any vibrations at all I set my camera to use mirror lockup. Normally when taking a photo the mirror in the camera will flip up just before the shutter opens to expose the sensor. This has the potential to cause minor vibrations and would be more prevalent with short shutter speeds. By locking the mirror up first before the shutter opens those vibrations are minimized. I also used a wireless trigger so that I didn’t have to touch the camera at all while taking the shot.